There’s a lot to consider when deciding which show to attend. Do you want to see a play or a musical? A comedy or a drama? A new production or a revival? But perhaps the most important question of all is where to go: Broadway, off Broadway, or off-off Broadway. The entertainment offerings in New York City extend beyond the Midtown theater district, and sometimes it can be a little tricky to determine if you’re on, off, or off off Broadway. Many productions start off and off off Broadway and move to the Main Stem, while other times the opposite is true. (We offer some examples below.) That Tennessee Williams epic you’re watching on 46th St. just might be off Broadway and that sumptuous tuner at Lincoln Center might be on Broadway. 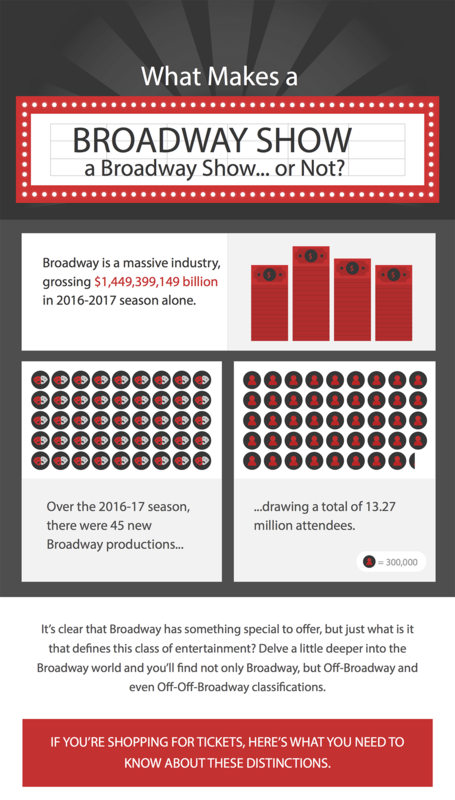 In our infographic, we’ve broken down exactly what you need to know when deciding what show to see and where to see it. But one thing’s for certain: No matter which theater you choose, you’ll definitely have a great night out.